North India Haze HIGHLIGHTS: The city continues to reel under the scorching heat. The temperature this morning was 33 degrees Celsius, five notches above the season's average. It is likely to peak at 41 degrees. Track the latest news here. 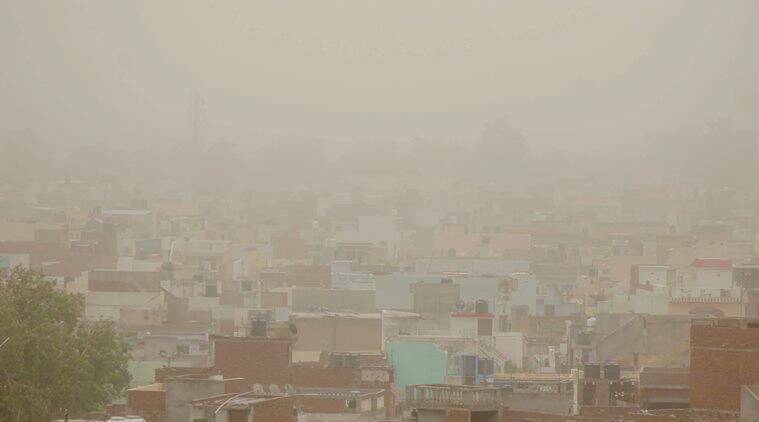 In wake of the poor air quality in New Delhi due to incessant dust storms in western India, the state government on Thursday directed to put on hold all construction work till Sunday. For the third straight day on Thursday, the capital city recorded ‘severe’ levels of pollution. 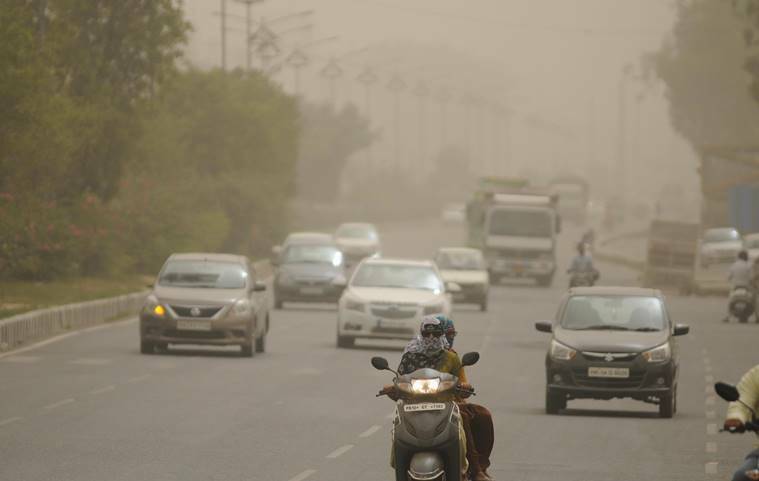 Dusty conditions, which are likely to continue through the weekend, also impacted visibility in Delhi-NCR. PM10 levels were at 796 at 8.30 this morning, reported news agency PTI. People have been advised to remain indoors as the current situation is likely to cause discomfort or breathing difficulties. The Central Pollution Control Board (CPCB) has directed construction companies, municipal corporations and the Delhi Pollution Control Committee to ensure water sprinkling to help reduce local dust. The city, meanwhile, continues to reel under the scorching heat. The temperature this morning was 33 degrees Celsius, five notches above the season’s average. It is likely to peak at 41 degrees. On Wednesday, the minimum temperature was 34 degrees while the maximum was 41.2 degrees Celsius. For the third straight day, New Delhi is witnessing 'severe' levels of pollution. Follow the latest news on the weather here. 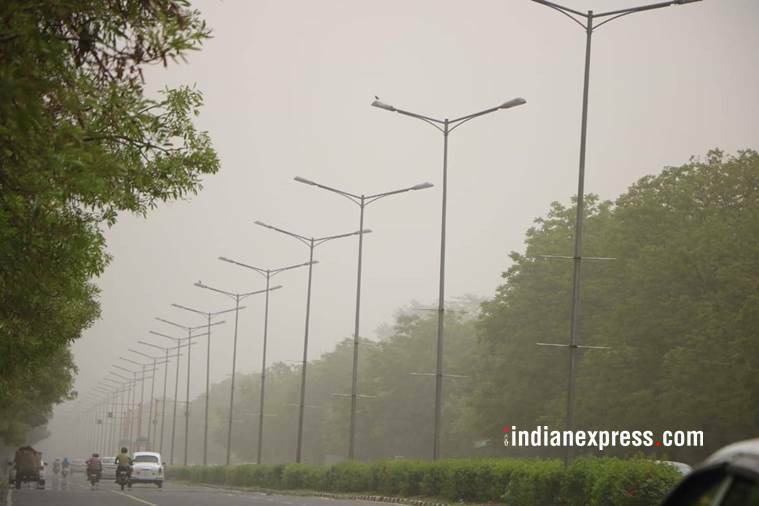 Dust storm is likely to continue over Rajasthan, Punjab, Haryana, Delhi and West Uttar Pradesh during the next 48 hours with the wind speed reaching 2,5­35 kmph. Though, the density of dust loading is likely to decrease from tomorrow evening, with the likeliness of thundershowers over parts of northwest India. According to IMD's latest weather update, thunderstorm accompanied with gusty winds and lightning is very likely at isolated places over Jammu and Kashmir, Himachal Pradesh, Uttarakhand, East Uttar Pradesh, Bihar and Tamil Nadu. Punjab has been witnessing dry and warm weather conditions for the last few days. Additionally, the city has been enveloped under a layer of dusty winds and obscured the sky for the last two days. Under the influence of constant dry weather, the temperatures have also started showing a rising trend, as per private weather agency Skymet Weather. Meanwhile, the number of people killed in the UP storm has increased to 15. "Fifteen people were killed in dust storm (since yesterday). Six died in Sitapur, three each in Gonda and Kaushambi and one each in Faizabad, Hardoi and Chitrakoot," an official spokesperson said, as quoted by PTI. "Besides, 17 people were injured in Sitapur and 11 in Faizabad," he added. Baijal also said that a three-month afforestation drive will be held from July 15 across the national capital. "Massive afforestation drive from 15 July-15 Sept. across Delhi will be undertaken. Residents' participation is welcome. Information about procurement of saplings, identified areas for plantation activities etc. can be obtained from Forest Deptt, GNCTD. Green Delhi our common goal," he tweeted. Delhi LG Anil Baijal tweeted, "Held an emergency meeting in view of severe dust pollution in Delhi with Hon Min @ImranHussaain and officials. Emergency measures like stoppage of all civil construction activities till 17th June. More monitoring by agencies like NHAI, DMRC, MCDs, PWD & NBCC etc. for ensuring compliance." At the meeting with the Environment Pollution Control Authority, the LG and Delhi government officials, it was decided that all construction work will be put on hold till Sunday. Also, all agencies must indulge in water sprinkling across the state. Those present in the meeting also decided to ensure better implementation and evaluation of tree-planting efforts this monsoon season. 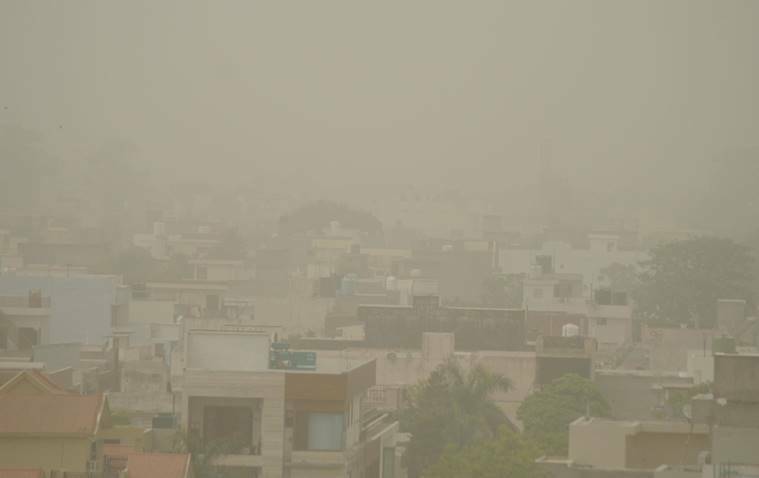 According to the Environment Ministry, dusty conditions are likely to prevail for the next three days. It has alerted construction agencies, municipal corporations and Delhi Pollution Control Committee to ensure water sprinkling. 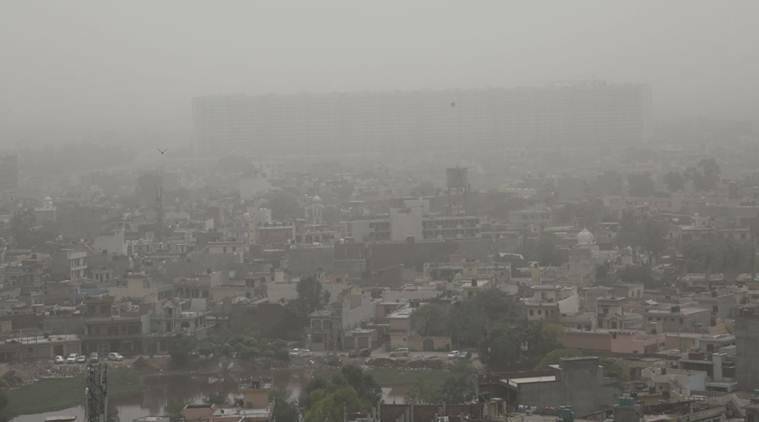 Delhi Food and Supplies Minister Imran Hussain said the LG has called for a meeting to discuss the pollution issue at 3 pm. "I have also called for a meeting on the environment issue in Delhi in my office at 3:00 pm but hon'ble @LtGovDelhi has also called for a meeting on the same issue, same time i.e 3:00 pm, in his office. I am going to attend the said meeting at the LG's office," he tweeted. An Air India flight from Mumbai to Chandigarh has been diverted to Delhi's IGI airport due to poor visibility in Chandigarh. Flights to and from Chandigarh were cancelled this morning and operations are likely to be cancelled through the day as Chandigarh battled with low visibility. Deepesh Joshi told The Indian Express, “The visibility is very low at the airport currently. The required visibilty is around 2400 meters due to ongoing runway upgradation and the present visibility is less then 1,000 metres." There are massive floods in Kerala's Kozhikode. At least three people are feared dead, and several trapped after a landslide due to heavy rainfall. Search and rescue operations are underway. Chief Minister Pinarayi Vijayan has taken stock of the situation. Read in Malayalam. From the South, as the monsoon gradually progresses, heavy rain is likely in Kerala, coastal and south interior Karnataka, Assam, Meghalaya, West Bengal, Sikkim, Arunachal Pradesh, Nagaland, Manipur, Mizoram and Tripura. Sea conditions along the west coast are likely to be rough and fishermen have been advised against venturing out to sea. Meanwhile, Tripura is witnessing floods due to incessant rainfall. Regions including Unakoti (Kailashahar) South Tripura, Dhalai, North Tripura, Khowai and Gomati District are critical. Chief Minister Biplab Kumar Deb has approached the Centre seeking immediate assistance from the Army and NDRF to conduct rescue operations along with local officials. The Centre has offered support to the state. Read the full report here. In Uttar Pradesh, at least seven people have died in the last 24 hours due to the dust storms. Over 20 others have been injured, 11 in Faizabad and 10 in Sitapur. Chief Minister Yogi Adityanath has directed officials to extend aid to those injured, and has announced compensation to the kin of the deceased. There is low visibility in cities across North India, which includes Punjab, Haryana, Rajasthan, Delhi, the plains of Uttarakhand and western Uttar Pradesh. This has affected flight operations, particularly in smaller cities. 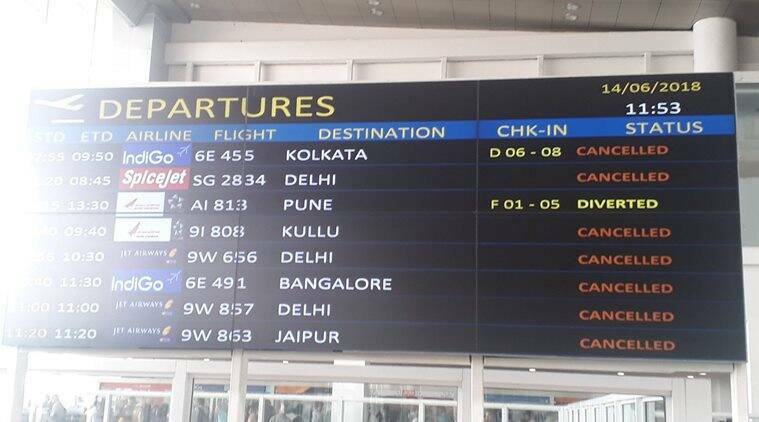 In fact, Chandigarh airport has cancelled all flights due to this. Here's a look at the Air Quality Index in Delhi NCR. These figures are from Wednesday. Since Tuesday, the national capital has been witnessing hazy and dusty conditions, causing "severe" air pollution. This is due to a storm, which originated in Rajasthan, and has extended all the way till western Uttar Pradesh. Weather agencies have predicted that these conditions will extend through the weekend. Follow our LIVE blog through the day as we bring you the latest news and updates. Dust storms in western India, particularly in Rajasthan, have caused low visibility, dusty conditions and "severe" air pollution in New Delhi. The storms have increased coarser particles in the air, according to data from the Central Pollution Control Board (CPCB). On Wednesday, the national capital was hazy and dusty as air quality fell due to an increase in PM 10 and PM 2.5 levels in the air. PM 2.5 levels were around 157 micrograms per cubic metre, while PM 10 levels were recorded at 797 micrograms per cubic metre at Delhi's R K Nagar.